Saturday was a finish line day for me, as it's the day I finally finished cobbling together a passable Shado figure in Poser. That 'scaly grey thing,' aka the Shado, is the character I use as my default avatar here on LiveJournal, as well as in other places like the Windstone Forum, Elfwood, Vimeo, and Twitter. 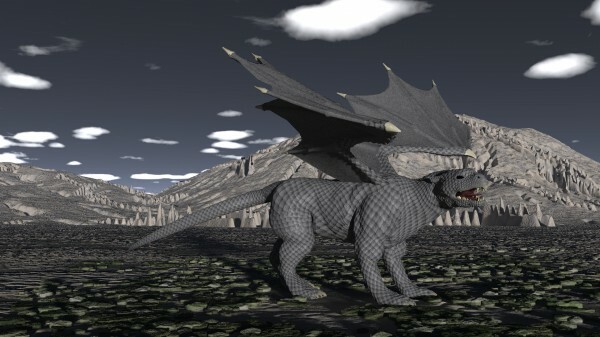 It's a very important character in my Geren books who has been around (in various forms) since 1994. I find it fitting, as the Shado and my 'muse' have a certain resemblance when it comes to insatiability, secrecy, and a disregard for courtesy or good timing! Have I mentioned they're both troublesome pests? It took a while. 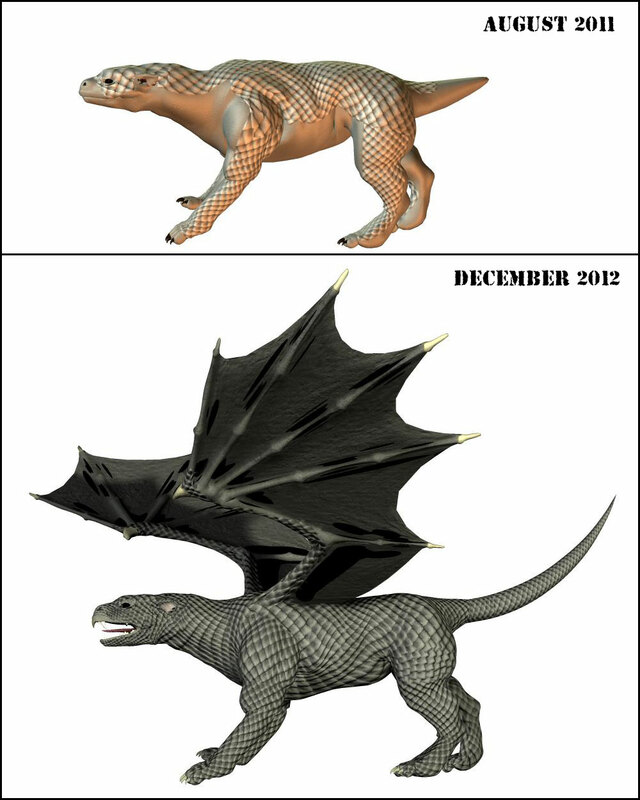 As the below image shows, I started working on the scales in August of 2011, after a little time spent pounding the wonderful Gargoyle Hound figure from Daz3d into a physical semblance of the Shado. The whole project proceeded in fits and starts, with the gaps where I was procrastinating, working on it in my head in hopes of sparing myself wasteful dead ends, or just plain busy with other things well outweighing the time I actually spent on it. But I think it was equally or even more troublesome than my base hyarmi figure, which also took an insane amount of work. Fortunately, those weird black artifacts on the wings don't carry over into Vue, and I really don't feel like spending two hours trying to find the obscure check-box or odd setting that is causing them. The Shado figure really is a composite, as the base Gargoyle Hound I bought lacked a long enough tail, as well as wings (or a hooked beak/jaw or triple-forked tongue, thought that last bit is still largely fail in the final figure). So I had to buy a snake figure for the Shado's tail. Bought it twice, actually, which was aggravating, but at least the second one that actually WORKED was half off. Can't forget the scales! They came from Turbosquid and are worth their weight in gold, though I'd much rather never have to work with them again. Of course there are all sorts of little things that are 'off' and beyond my ability to correct, just like with my hyarmi and t'DoL-figures, etc. But I am pleased to have reached this finish line with something good enough to use for future illustrations, too many of which have been clamoring at me from my art to-do list for years already! It's wonderful timing too, as I'm getting underway with 'TFE,' the Shado-novel. Scaly things of sundry hues on an alien world are going to be filling my mind in the months to come.